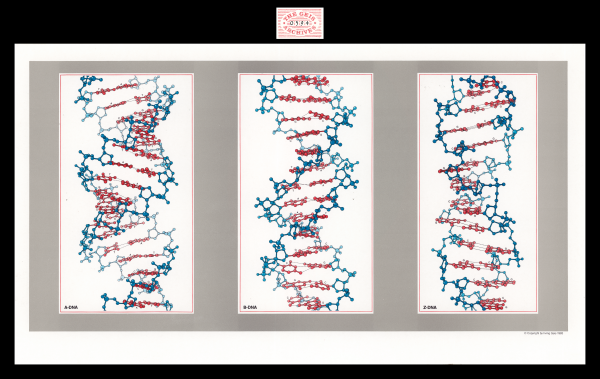 1983, 11" x 19 3/8"
Deoxyribonucleic acid (DNA) is responsible for storing genetic information and contains all of the information that an organism needs to develop, grow, and survive. The DNA of an offspring contains information from the parent generation. DNA is a chain of nucleotides, which are each composed of a deoxyribose, a phosphate group, and a base (adenine, thymine, guanine, or cytosine). The structure of DNA is a double-helix and base-pairing occurs between adenine and thymine and between guanine and cytosine (according to Chargaff’s rules). Adenine/thymine base-pairing consists of two hydrogen bonds and guanine/cytosine base-pairing consists of three hydrogen bonds. The sugar-phosphate backbone is closer in some portions of DNA. The major groove of the double-helix occurs when the backbones are more distant and the minor groove occurs when the backbones are closer (“Major and minor grooves” website). DNA can have several conformations. The most common one is called B-DNA. B-DNA is a right-handed double helix with a wide and narrow groove. The bases are perpendicular to the helix axis. DNA can also be found in the A form in which the major groove is very deep and the minor groove is quite shallow. A-DNA is also a right-handed double helix. A very unusual form of DNA is the left-handed Z-DNA. In this DNA, the basic building block consists of two nucleotides, each with different conformations. Z-DNA forms excellent crystals. 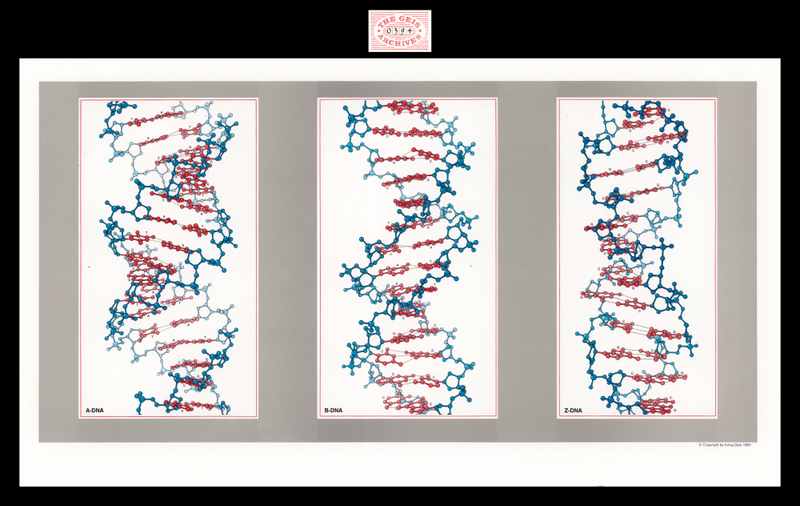 Other nucleic acid shapes include quadriplexes, triplexes, Holliday junctions and hairpins.